Last night I was able to drill the 4 attach holes for the rear spar of the horizontal stabilizer. This went much easier than the front spar. I basically used the pre-drilled holes to back-drill through the spar at #30, then came in again from the rear of the plane to open them up to #12.. Was easy in this case. Mounting these 4 bolts sure adds strength to the entire Stabilizer. Next I trimmed the 5/8 inch off the vertical stabilizer and temporarily clamped it in place. It was a tight fit at the base of the rear spar of the vertical stab.. I had to open up the fuse skin with my hand seamers to get it to fit properly. It sure ended up being a perfect fit between the longerons though. This sure makes my garage look small, but at the same time really looks good on the plane..
Wow, it has been a long time since I have done anything with the empennage.. Time to pull it out, dust it off and mount the horizontal stabilizer to the back of the plane. I am only going to mount it temporarily, but while it is on the tail I will wire up the back end of the plane to get that out of the way. Mounting it seemed pretty easy.. Clamp it to the tail, then measure everywhere to make sure it is straight.. Then drill.. The outside holes went really well, for the inside holes you must use the 90 degree angle drill.. Did I say how much I dislike those drills ? Well after fighting with it a bunch, I finally got the holes drilled on the forward spar.. The rear spar I have yet to do.. However, I went ahead and mounted the elevator and connected it to the stick.. For the first time I was able to make parts of the airplane move ! Bekah wanted to get a video, but probably just to make me feel better.. I figure it wasn't really that impressive, so we will wait. In the end I was able to control the elevator from the pilot stick. It was a great feeling.. Now I need to complete the rear elevator stop as well final drill the rear spar to complete the horizontal stabilizer before starting on the rudder. Sorry for the sideways picture below. If I angle the camera at all the pictures get posted sideways and I haven't been able to figure out how to resolve it. Any thoughts? I am calling the Canopy done for now. I went ahead and screwed it down to the canopy frame and just snugged it up. Basically I want to make sure that I have the front top skin on and riveted before I do any final fitting of the canopy. This includes the fiberglass faring in the front. I will probably get to that next summer but wanted to wait now because I may need to move the plexi around a bit to do some of the final fitting work once that skin is on. So here are some pics of what she looks like before I put the canopy upstairs on the guest room bed. ;-) Oh, and notice the glare shield cover and the preliminary panel cut outs. This weekend I flew down with a friend in his Long Eze Canard to Prineville Oregon. 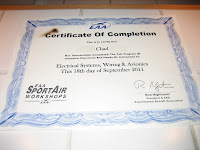 I went down there for the SportAir training workshops and participated in the Electrical Systems course. I am really close to a turning point on this project. The first couple years are all structural, the next couple years are mostly electrical and firewall forward so this class was fairly perfect timing. These are put on by the EAA and costs some $$ but are well worth it. I learned quite a bit as you can see from the syllabus. Also got some practical work on several projects.. One of which you can see in the pic below. Not much, but each project covered many different concepts. Over the last couple days I have been debating on a defroster or not in the glareshield. 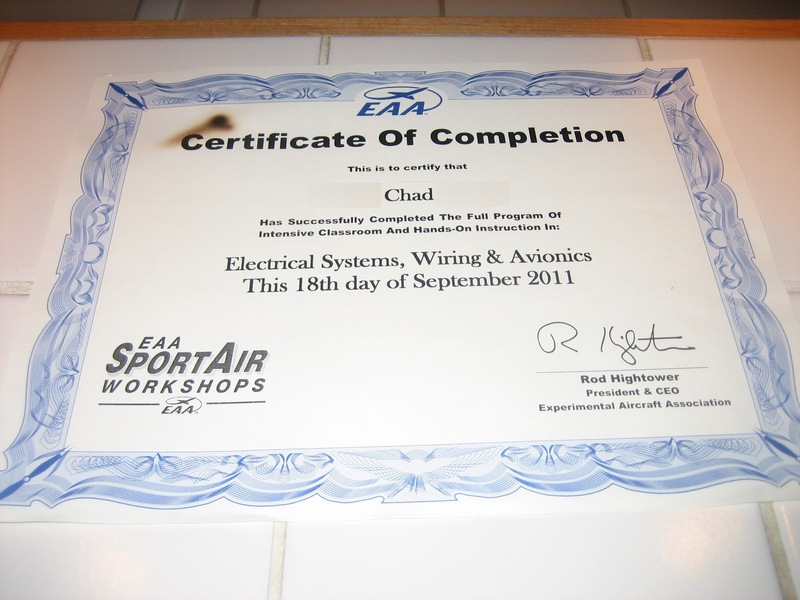 I decided to throw one in since it isn't much extra work and its better to be safe than sorry when I decide to go IFR.. I am going to connect this little computer fan to the master switch so it will always be running. No switches on the panel, and when its hot, it will help circulate air out of the instrument cluster behind the panel when its cold it will take warm air from under the panel and blow it up onto the canopy.... Its a win win.. Plus I get to play around with some cool fan covers..
After working on the fan, I drilled the aft canopy lugs with a 3/32nd drill. I will open up the hole to AN3, but only after the front skin is riveted on and the canopy is in its final position. These lugs need to be just perfect so that the canopy is snug when closed. I also painted the glareshield and the roll bar. I hadn't completed the roll bar yet and was sick of looking at it primed.. Now things will look really nice in my cabin. Wrapping up on the Canopy ! I admit I haven't been as diligent at logging progress on the canopy as I have on other parts.. I am sorry for that, but at least I have lots of pics that hopefully will help any prospective builders. All I can say is there is a lot of on and off and fitting and trimming and filing involved and then in the end I am leaving everything a bit long until the front top skin is finally riveted on. Then I will final trim the rear and side skirts on the canopy. But as you can see things are fitting quite well right now..
Also, make sure the front top skin is at least clecoed on for every measurement and cut on the canopy. I realized that with the skin off the canopy frame sits back about 1/8th inch aft. Also, all I have left at this point is riveting the center stiffener on and doing the fiberglass fillet in the front of the canopy. I might hold off on this until later as well. The center stiffener is waiting for a defrost fan that I should get in the mail in the next couple days. Its an option that I might go with but will have to check it out when it arrives.. The fan will go under the glare shield and inside the stiffener.. I haven't entered a post for a while, but have been working away quite consistently.. Let me try to sum up my progress.. I drilled and final finished the rear window. Fit it then wrapped it up and set it aside.. That window won't come out again until it is ready to be installed permanently. I also started working and actually finished my side rails on the canopy frame. These guys went fairly easy, but the trick is to make sure the canopy frame assembly is in its final position, which means the front top skin needs to be on when you fit the and cut the side skins (AKA Side skirts). After they were drilled, fit and primed I riveted them in place. Just moving along quickly with this canopy I actually final coated the canopy frame.. Black and I think it looks good.. Also did some final finishing of the canopy plexi edges. I left the rear of the canopy about 1/16 inch long for now and will trim it as necessary after the front top skin is riveted in place. Next step is to figure out if I want to install a defrost fan, or just finish this thing up by riveting in the stiffeners. I will mull on that for a couple days and talk to some guys on the blogs.